The Regional Greenhouse Gas Initiative (RGGI) will hold its 36th auction for carbon dioxide (CO2) emission allowances on June 7. In the previous auction, held in March, more than 14 million allowances were sold at a clearing price of $3.00 per short ton of CO2, the lowest price in more than three years. CO2 allowance prices in March were down 16% from the clearing price of $3.55/ton in the previous auction in December 2016 and 60% lower than the peak of $7.50/ton at the December 2015 auction. RGGI is the nation’s first mandatory cap-and-trade program for greenhouse gas emissions, covering the nine states of Connecticut, Delaware, Maine, Maryland, Massachusetts, New Hampshire, New York, Rhode Island, and Vermont. The original objective of the RGGI was to reduce the carbon emissions of each state's electricity generation sector by 10% from their 2009 allowances by 2018. However, the combined effects of lower natural gas prices and state renewable portfolio standards have resulted in regional CO2 emissions falling below the original RGGI cap, and the cap was reduced in 2014 by about 45% from the 2009 level. Electric power sector CO2 emissions from the nine RGGI states accounted for approximately 7% of total U.S. electric power CO2 emissions in 2016. Total CO2 emissions from member states in 2016 were 79.2 million tons of CO2, lower than the revised cap of 86.5 million tons CO2. Even though RGGI reduced its emissions cap, actual emissions have remained well below the cap, resulting in a surplus of allowances. In some cases, surplus allowances can be banked for use in future years. However, the availability of too many banked allowances reduces the need to purchase new credits. Significant slack in the RGGI allowance market is not an entirely new phenomenon. In several auctions between 2010 and 2012, some allowances were left unsold. Following the release of the Clean Power Plan in August 2015, bids were submitted for more than three times the total number of RGGI allowances offered, creating demand that led to higher allowance prices. 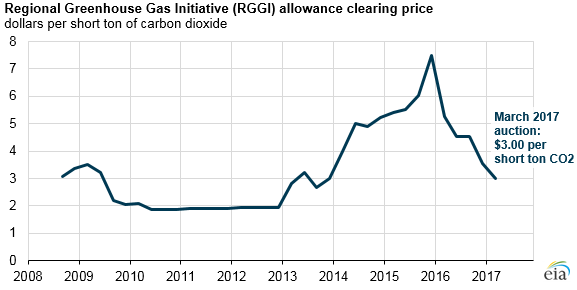 The downward trend in clearing prices since the start of 2016 reflects relatively low demand for RGGI allowances. Note: CPP is Clean Power Plan. The March 2017 auction generated $43.1 million that the RGGI states can use for a variety of purposes, including those that support energy efficiency, renewable energy, direct energy bill assistance, and greenhouse gas abatement programs. In the March 2017 auction, demand for allowances continued to decline, but all allowances offered were sold. Recent revisions to the program included an adjustment to the reserve price, which effectively sets a minimum allowance price. For 2017, this reserve price is $2.15 per ton CO2, up from $2.10 per ton CO2 in 2016. In 2014, the RGGI states announced two interim adjustments to the RGGI cap to account for CO2 allowances that were banked in 2009 through 2013. The combined effect of these two adjustments lowers the cap by 139.5 million tons of CO2 from 2014–2020.